A guardian angel or the fallen angel? Or just an artist expression without secret metaphysical meaning and hidden metaphorical messages? The sculpture PHYLAX installed in Palaio Faliro divides the Greek society and stirs the “Greeks’ moral principles” as usual. Opponents see in the provocative red naked man with wings, the Heosphoros, the Dawn-Bringer, the satanic Morning Star, the Devil, elements of satanism and even of black magic and accuse the artist of mocking and offending the Christian traditions. Phylax has been installed in Palaio Faliro on December 5th and was announced by the local Municipality as the “guardian-angel” of the suburb in south Athens. The sculpture is a present donated by the Martinos shipping family to the city of Palaio Faliro. Phylax is an Ancient Greek word meaning watcher, guard, guardian, protector. The sculpture is installed in Trokadero, very close to the entrance of Floisvos Marina, between the chapels of Agios Georgios and Agia Skepi in the old Poseidonos Avenue. “Who says that the color of satan is red? 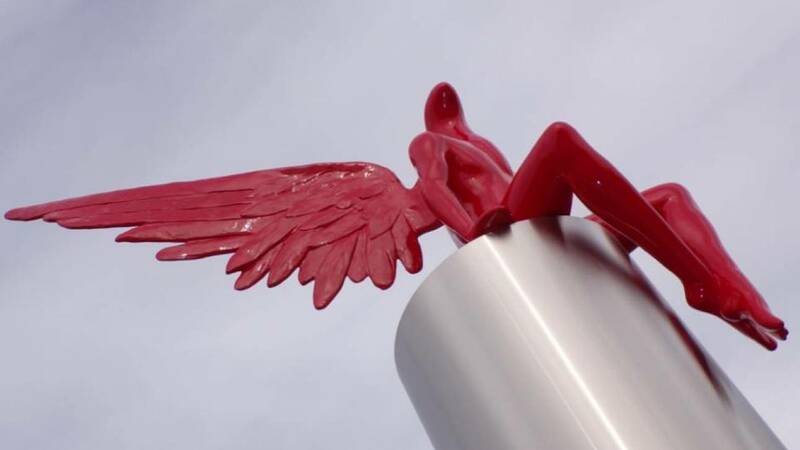 there are angels with red wings and red hair” artist Kostis Georgiou told private Skai TV on Thursday morning just hours after unknown perpetrators threw white paint on the sculpture. 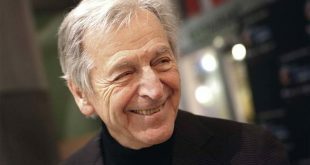 Georgiou seemed pleased that his Phylax has been in the middle of a dispute saying that art should not leave people indifferent. Throwing paint on the controversial sculpture is the second attempt to vandalize the Phylax. A couple of days earlier, unknown perpetrators cut the wires of the Tram nearby, apparently thinking they they would cut the power that illuminates the Phylax at night. 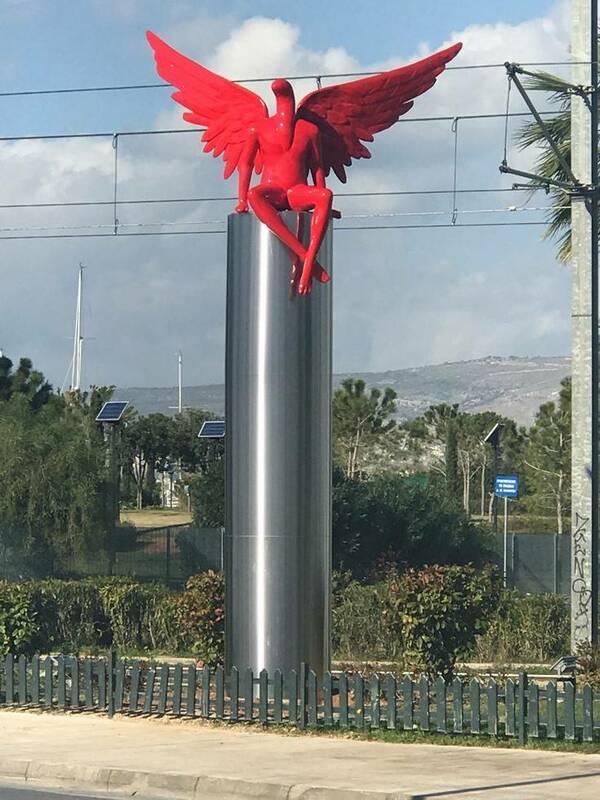 The criticism forced the local municipality to issue a statement that says the Phylax is not a guardian angel in terms of the Christina tradition. 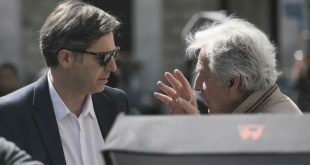 In his interview Georgiou defended his art work saying that the criticism started by some ultras like newspaper Eleftheri Ora and the [fake] monk, self-proclaimed Father Kleomenis, a hate-preacher. “It is supposed that the opponents are Christians but their soul is anti-Christian,” Georgiou stressed. There are reports of signature collection among the residents of the suburb to have the sculpture removed. Except for the alleged semantic-religious controversy some locals are reportedly also bothered by the aesthetic of the Phylax claiming the red color does not fit to the green and blue profile of the city right next to the sea at the Athens Riviera. And you , what do you think? Do you believe Phylax offends Christian values? How do you like Phylax in terms of asestetics? PS I must admit, I also thought of “the fallen angel” when I first saw the sculpture. Blame my Greek orthodox culture although I consider myself an atheist. I thought, “WOW! Provocative! Progressive!Great!” And yet, I was shocked. However, not because of a huge satan looming over the area where I go for my walks. I personally have an issue with the color as I am not a great fan of ‘red’. On the other hand, the more I look at the sculpture the more I see the point, the more it makes sense to break the green-blue-white monotony of the Palaio Faliro skyline with an aggressive touch of alive and kicking juicy Greek-tomato-in-July red. In that sense, I can live with Phylax, or better say I can walk by the red devil without fearing it will fall on my head. The colour is garish. Either a deeper red or black, in my opinion, would be far better.